First place went to: John Lottery. He chose the ad for a year as his prize. Second place goes to: Ivy. Her story will be featured today. Now, here’s a good spot. If I angle this chair just right, I can see clear down the block. I wonder if young Linda will receive another bouquet. That boyfriend of hers must have been up to his old tricks again. Showers her with flowers and candy anytime he’s been caught. Yesterday it was lilies. He’s a bad lot, but she’ll probably marry him anyway. That type is a martyr for cheaters the likes of him. She’s just like my friend Mary Sul- “Daisy! Don’t you dare put that slug in your mouth! Put it down! I said put. It. Down.” Sigh. So, I grew up, got married and took care of children, then I grew old and here I am still taking care of children. I don’t mind that much. I’ve got cute grandkids, not like those doughy little monsters poor Edna ended up with. I swear I’m not going over there anymore when she has them. That small one ate every crumb of that pie Edna served me, and her thinking it was funny! That bigger one kept on shooting rubber bands at me and Edna just sat there ignoring it. I won’t be surprised if they all grew up to be delinquents someday. “Daisy! Let that dragonfly go!” Little imp. She was about to put the thing in her mouth too. I bet she’s already had some helpings of grass and dirt anyway, sneaky thing. Oh, isn’t that Pastor Ken’s car? Yes, it is. I suppose he’s up to visit Jim. Rascal didn’t go to church two Sundays straight, probably claims it’s his lumbago. Lumbago, my foot! I’m sure as anything he just didn’t wake up in time, him hanging out all night at that watering hole near the river with his fishing buddies. He’ll be sorry when the - Now, hang on. Who’s that moving around Mabel’s house? The place should be empty. I’d go over and investigate if I didn’t have Daisy with me. Should I call the police? The last time I did that, they didn’t thank me for my troubles. How was I to know that that foreign boy was hired to clean the windows? Whoever started that rumor about me being a Nosy Parker is just plain unkind. I’m sure I don’t go around minding other people’s business. If I sit out here and get to observe everything under my nose, that’s not poking it where it doesn’t belong. If I seem to know more about something than the next person, it’s just plain oincidence. There’s no need to make snide little cracks about it. I really didn’t appreciate Tom’s joke the other day. As if I go about town snooping for gossip! Anyway, what to do about Mabel’s house? It could be she came home early from her cruise. That’s not likely. I’ll never forgive myself if she gets robbed and I could have stopped it. Ivy, you can go to More About the Contest and choose any gift except the blog ad. Be sure to send me your address! Ellen and I did about 6 miles on forest roads today to find more pieces of the Adventure Loop. We found this pretty little turtle on a real county road, though. We stopped, and I moved it to the side of the road it was headed for. I hate seeing turtles get smashed in the road. 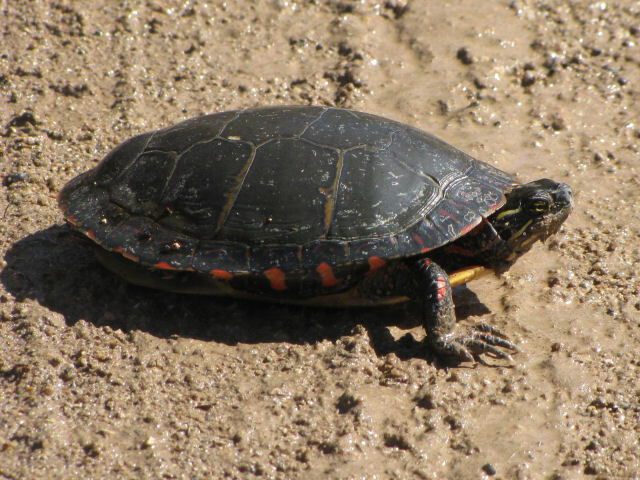 This is the common painted turtle, Chrysemys picta. This is the species that used to be sold by the thousands for pets, before so many of them were associated with salmonella. 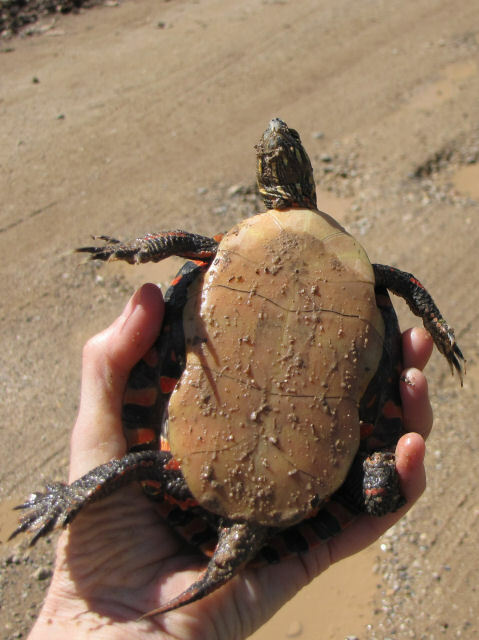 This one is low-average size for a wild turtle- about 4 inches long (shell only) and 3 inches wide. I've seen a lot of larger ones though. What might be surprising is how fast these animals can move when they want to. You can see those long legs when he wants to stretch them out. I'm really tired tonight... off to bed. Tonight, I gave a program at the West Michigan Izaak Walton League annual dinner. 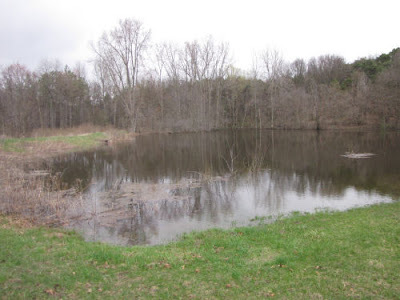 They have a little pond on their property, and I took a short walk beside it, thinking I might see a bird, or some flower of interest. Instead, look what I found! And the silly thing is so used to people that I got some really good pictures. 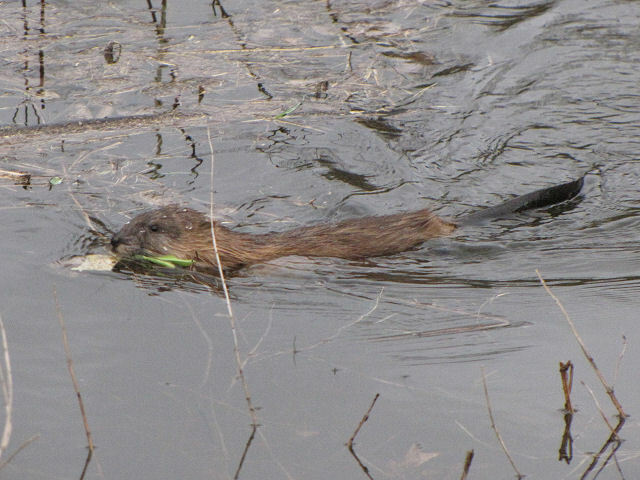 This is the muskrat, Ondatra zibethicus. If you want, you can compare it with the otter. 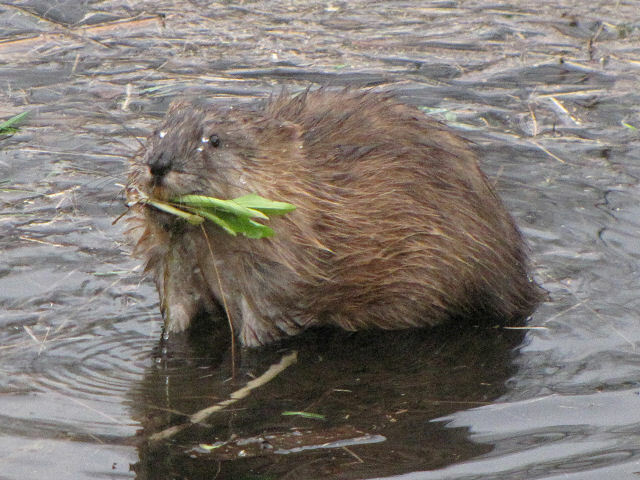 It dove down to the bottom of the pond and came up with some salad to enjoy. Plain. No dressing (except maybe a little mud). It sat there and watched me and ate, while I watched it. A mutually satisfactory arrangement. I'll be bringing you the rest of the stories over the next week or so, one at a time. When interesting things happen outside those will have priority. That way, hopefully, you won't get tired of reading stories! Everyone was a winner! There were four entries and six awards, so anyone who entered gets to choose a gift. The only question is the order in which the entrants get to make their selection. Here is the picture that was to inspire a story of 300-600 words. The stories were judged by members of the writers' group that I've been attending. The stories were judged on their appeal, not perfect English or mechanics, although none of the entries was poorly written. First place goes to: John Lottery. His story will be featured today. Second place goes to: Ivy. Third place goes to: Canadian Doomer, a new blog friend whose real name I don't even know yet! Perhaps the earliest memory that I can remember is playing in the grass on a warm spring day. Grandmother had packed a picnic lunch for the two of us and we pretended to be visiting the Park As we walked out of the house, I saw a butterfly zigzagging aimlessly just above the grass. I ran down the steps and followed the critter around the house. Round and round we went, as if the monarch led me on a leash. Grandmother watched in absolute amusement. She placed her chair at the foot of the steps and listened to my childish giggles. As if on cue, the butterfly alit on a dandelion just feet away from Grandma. I quietly tiptoed to where it twitched its wings, careful not to scare it away. Then, I slowly sat down and spread my legs. Oh, how I wished I could fly. Living in a small Michigan town, we knew there was rarely any traffic. Occasionally a neighbor would peek out the windows or shake out a rag. But no distractions would interrupt my imagination. The winter was harsh, but the three feet high snow had finally melted. The grass was turning green and had the fresh cut smell. My sisters were in school and wouldn't be home until 3. Mother worked in the dress factory and would walk home with the women at 4pm. 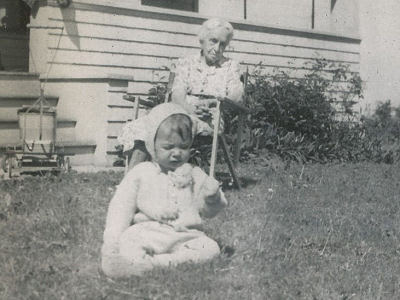 So it was left to Grandmother to be my babysitter, playmate, and friend until I was old enough to go to school. Easter was around the corner and I hoped that the butterfly would lead me to the Easter bunny. Oh, what a day, sitting in the sun watching the magnificent orange winged creature that I believed to be an angel. Grandmother handed me a peanut butter and jelly sandwich. I took a bite and offered it to my friend She flapped her wings and instantly flew onto my nose. It tickled my cheeks and I started to giggle. But the butterfly didn't move. Watching me play, Mrs. B walked out of her house and crouched on the sidewalk. "Smile" she said and clicked the trigger of her Brownie Instamatic camera. Just then, a gust of wind blew across the yard and the butterfly was gone. Higher and higher it went until I could see it no more. Oh how I cried after I lost my dear friend. For the next few days, I would search for this bug inside and out, but could not find it anywhere. Alas, Mrs B came to my rescue. She had her pictures developed and had a present for me. It was the photograph of me, sitting on the grass with the butterfly on my nose. Grandmother was behind me, pleasantly smiling. Though 80 years have passed, I always sit in the grass, clutching my photograph and waiting my turn for the butterfly to return and carry me into the heavens of eternity. John: Go to More about the contest and claim your prize. It rained almost the entire day, and that was a good thing! We need rain here- quite a few of the recent storms have missed us, and things are dry. I also needed to spend a good solid day of inside work without being tempted to head off into the woods. I'm showing you a visitor to the yard from yesterday. 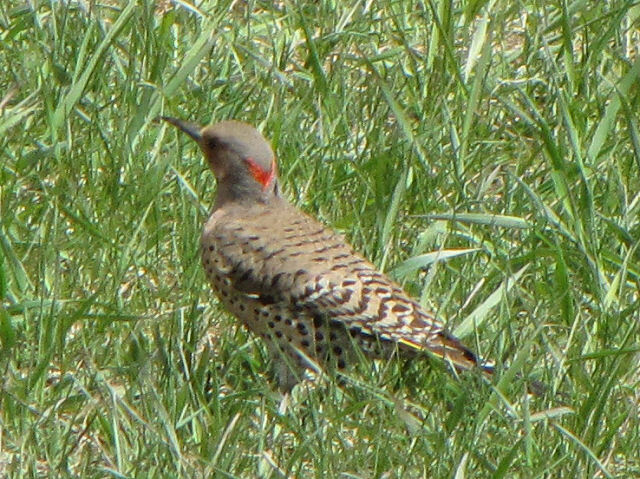 It's the northern flicker, Colaptes auratus, a kind of woodpecker. You've seen it before if you are a regular visitor here. They always seem to like my lawn. This one is a female. It's easy to tell because males have a large black "mustache," which this bird does not have. Maybe I'll get lucky and have a male visitor who wants to pose. The focus on these pictures is much better than the ones I took in 2009, and these are from the back so you can see the red stripe on the head. You can also see one of the yellow shafts on the tail feathers. 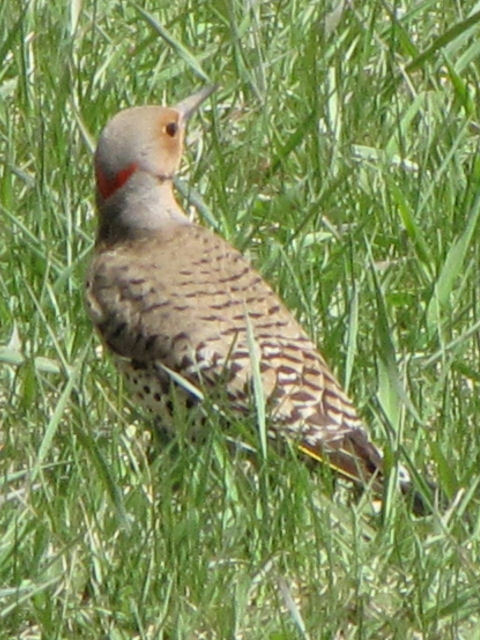 This is sometimes called the yellow-shafted flicker because of that. Flickers in the western US usually have red shafts. They used to be considered a different species, but now they are known to be regional variants of the same bird. Click one of the pictures to reach some other views that show the black bib in front. Om came home this afternoon and said, "I would go on a short walk somewhere." After I picked myself up off the floor I started trying to figure out where to go that was the right length, and not too far away. I picked Ruby Creek. Then Om said, "Will there be sun?" Not really- it's woods beside a creek. But he decided it was ok. I needed gas, but decided to wait till on the way home. And look at this! I managed to provide sun. Whew! This is such a beautiful place, it's too bad that the trail is so short. 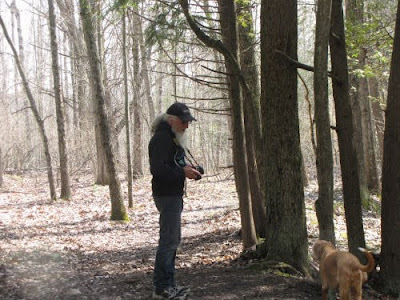 If I have to drive 20 miles each way, I want there to be more than a half-mile of trail. Nevertheless, it's a magical little creek. As you can see, today it was golden, despite it's name. There is a pavilion and a pond. The pond is sometimes stocked with fish for kid's fishing. 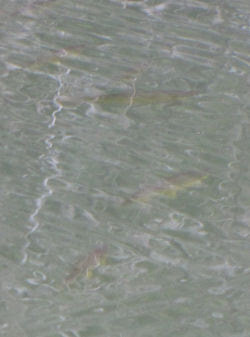 The light wasn't right for seeing below the surface, but you can see some little fingerlings if you look hard. It's so neat to see things alive and moving around, that I willingly bring you this crummy picture! And, AND, lookie, lookie! Finally, I can show you a wildflower other than that one little violet. This isn't spectacular either; it is small, and all by itself, but it's one more little promise. It's a hepatica. The picture is oddly shaped because I wanted to keep the leaf in. It's that lobed one in the lower left. There are two kinds of hepatica, and the difference is the leaf shape. This one is round-lobed hepatica. But I saved the best for last. Maggie found this! She was sniffing something, and Om went to see what it was. 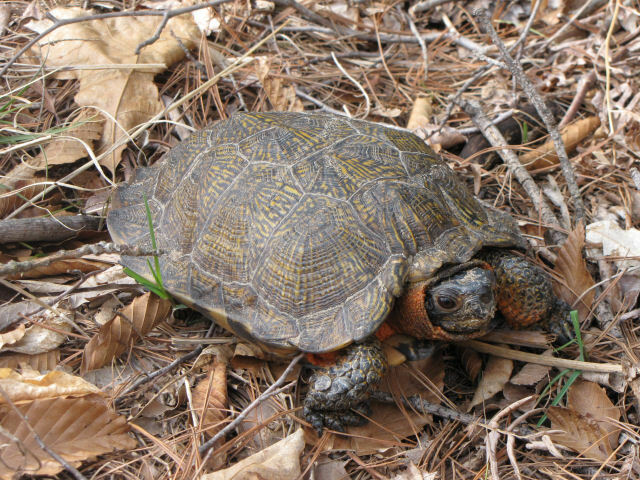 It's a wood turtle, Glyptemys insculpta (that's a new scientific name, used to be Clemmys guttata). They aren't rare, but are considered vulnerable. I see one every so often, but not every year, so I was delighted. If you click the picture, it will lead you to more pictures of this handsome reptile. So, I'm calling this my B-day present from Om. The big mistake? Gas was $3.96 when we left home. When we came back it was up to $4.17. Yikes! But the rest of the day was great. I even dried laundry outside. We had a brunch, since Om comes home hungry from the paper route. 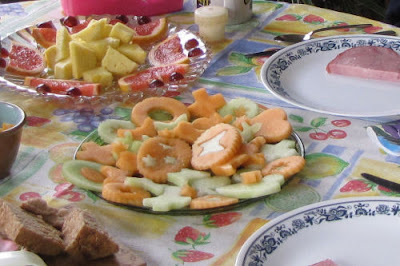 We majored in fruit with a little slab of ham and some bread. Then we went to church. 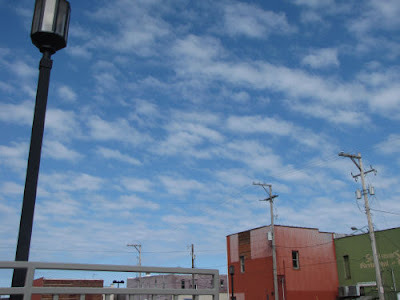 Look at this sky! Sorry about the ugly buildings, but church is downtown. However, isn't that the point? The glorious beauty pulls our focus upward, above the mundane. He is Risen! Loretta always knows just the right things! 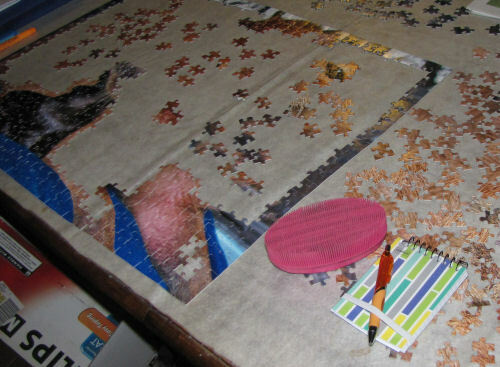 She sent a jigsaw puzzle. 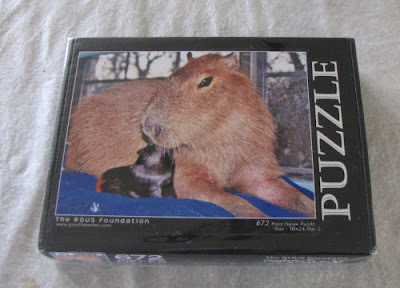 It's got a capybara (the largest rodent in the world- looks like a guinea pig the size of a golden retriever. It's cuddling a regular guinea pig. Of course, you know how long I could resist that. Well, I did wait until today to start it. She also sent a dog brush that is soft rubber and works really well (the pink thing). Ellen gave me the little notebook and pen. She noticed that I carry a set like that to make notes about trails. I've decided to share wildflower pictures from another year. I need the color! (I had to find one of them to use with my newspaper column, and it took me two hours to do that, leaving me little time for other options.) All of these plants like Great Lakes sandy soil, and are usually May bloomers. 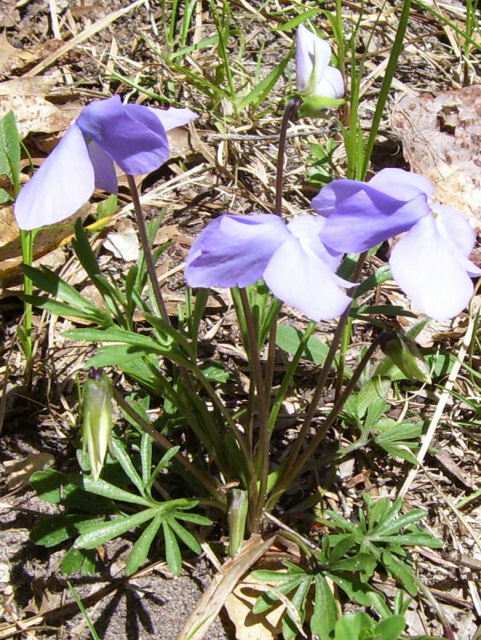 First: here are the flowers that go with those leaves from yesterday, the birdsfoot violet, Viola pedata. 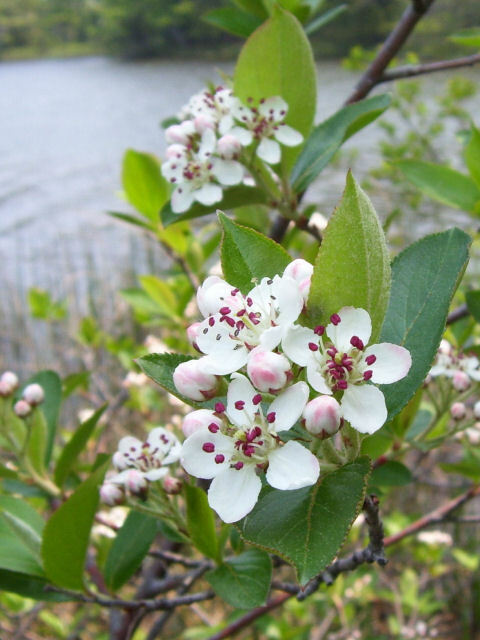 Here's another beauty, the purple chokeberry, Aronia prunifolia. Some botanists think it's a hybrid of the red and black chokecherries. 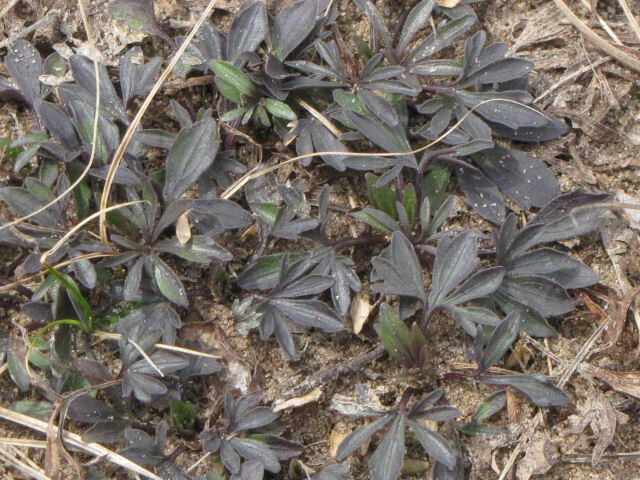 Here's the one I needed to find: The hairy puccoon, Lithospermum caroliniense. 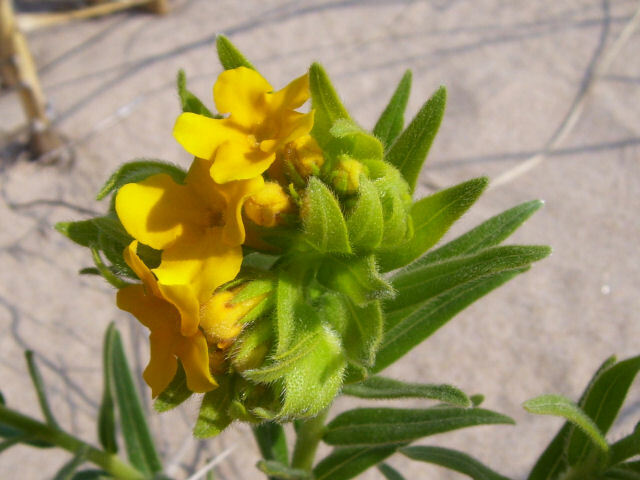 "Puccoon" is a Powhatan word that indicates the plant was used to make a dye. Supposedly the roots will make a red dye. It's tricky to tell this one from the hoary puccoon, but I've stuck my neck out and IDed it as hairy. Happy Easter! Don't forget to enter the contest and Praise the Lord! 1. Take a friend (Ellen). 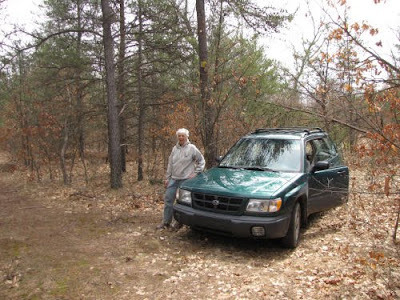 Find a place in the woods to leave a little green car. 2. Hike about 3 miles on sand roads that look as if they are never used (wrong). Talk with a man in a white pickup truck who passes us who assumes that we are lost. Talk with a man in a black pickup truck who IS lost. He wants to know if we can help him find 6-Mile Bridge. (We could, but he was really not anywhere near where he wanted to be, and had no idea how he got where he was. I drew him a map and sent him on his way). 3. 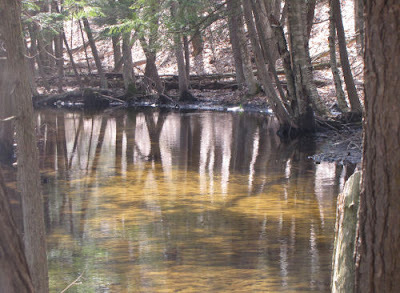 Find Black Lake, a tiny little kettle hole lake with public land on the north edge, and three cottages on the south. 4. Try to find a spot out of the wind- not a possibility. Sit down anyway and pull out our lunches. Try to eat normally and pretend that we are really having a good time. Finally admit to each other that we are freezing and that it seems like the temperature has dropped in the last 90 minutes. 5. 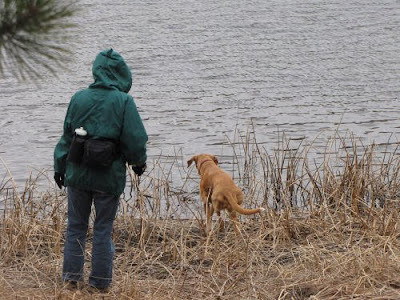 Try to get the dog to take a drink from the lake. "I'm not putting my feet in that cold water," says Maggie. 6. 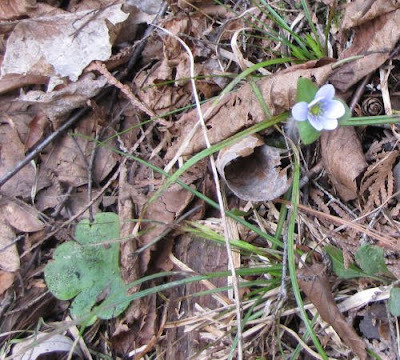 Find leaves of birdsfoot violet! At least some hope of a wildflower or two before June. 7. Hike back to car, and express joy in being outside in a good temperature for hiking (just not sitting in the wind!). Fridays with Ellen are getting to be one of the best parts of my week. Not too many people think that these kinds of activities make a nearly perfect day. Anyway, we walked around Tallman Lake. I was hoping there were some little unmapped roads that would keep me closer to the lake, but there were only the roads on the map. We took the way I've marked in red. It was about 3.5 miles- a nice length. Maybe that's why she was barking! Tallman Lake is mostly private, but it does have a small public access spot, which is where I parked. The water was really low, making the dock area quite ugly. I won't even show you. This is a better-looking place. On the east side, we crossed this little, un-named creek. Very pretty- but still brown. 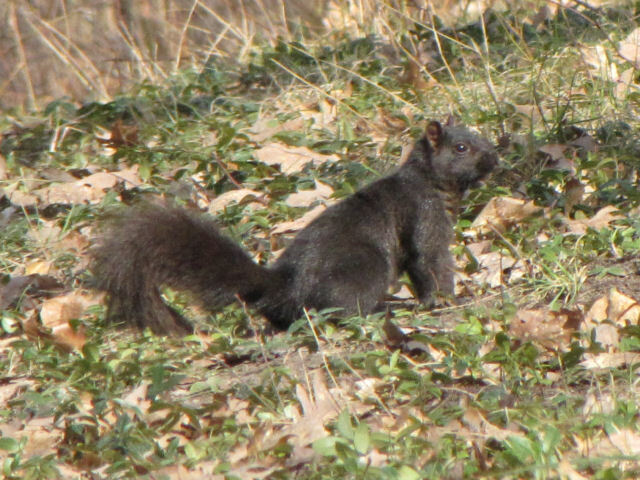 Possibly the best sighting- well, that I got a picture of- was this nice black squirrel. He doesn't look as friendly as Ratty's squirrels, but I think they all have their minds on the next meal. This one certainly does not seem underfed. 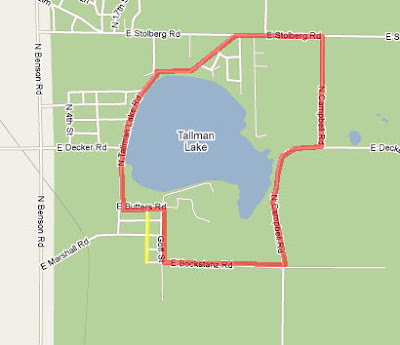 So, now you have walked around Tallman Lake. It was nice to do something new, but I was hoping to see the water more. Today's work was more a tale of five rivers than small lakes. Why did I spell them in French? Sounds sophisticated? I ended with the Pere Marquette- named for a French explorer? To be mysterious? Yes. 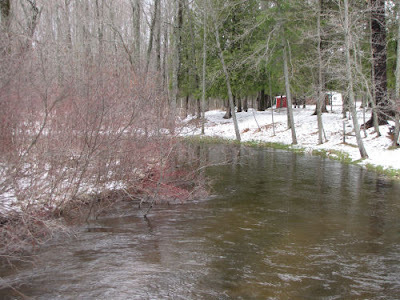 First we have the Big Sable River. You won't see this view from the road. This is from a private back yard... not bad, eh? This is the river that empties into Lake Michigan at Ludington State Park. Oh, that's French too- "big sand." The view is downstream. Next, I headed to the far NE corner of Lake County. I drove over 150 miles this afternoon visiting sites. 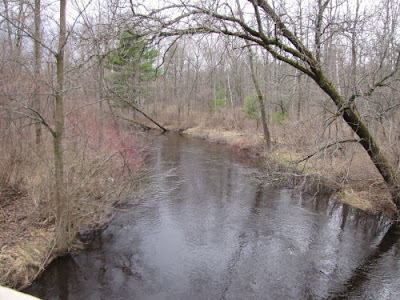 I crossed to the north side of the Little Manistee River on Old M-63. 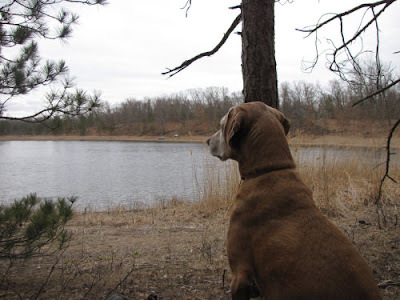 "Manistee" is an Ojibway word that loosely translates to "Spirit of the Woods." That's why so many things/groups around here have that name (like my trail club). 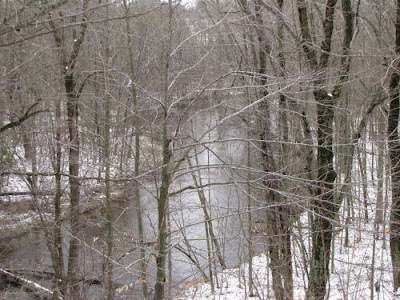 Here's the downstream view of the Pine River from Raymond Road. This is only a little bit upstream of the hikes on Silver Creek Pathway where you've recently seen the Pine. Both the Pine and the Little Manistee flow into the (Big) Manistee River, which reaches Lake Michigan at the city of Manistee. 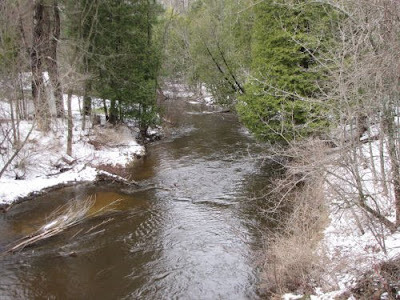 But, I'm still on the north side of the Little Manistee, and need to head south again. 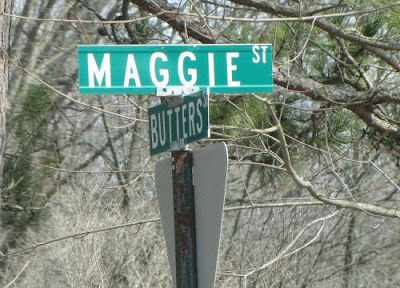 So I recrossed it on Birch Street at the village of Luther. 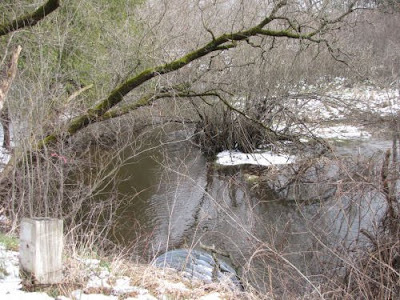 This is the upstream view, and it's also upstream of the earlier picture by nine road miles- who know how many river miles that is- at least twice as many. Then I scooted southward, and crossed the Baldwin River at Baldwin, which were named for the governor of Michigan in 1872. 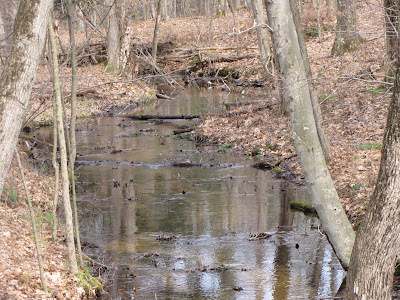 This river crossing is on M-37, and in just a short distance it flows into the Middle Branch of the Pere Marquette. You are looking downstream. 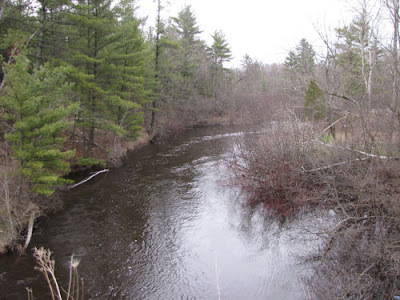 In just two road miles, you reach that Middle Branch of the Pere Marquette, still on M-37. I had four sites to visit down there, and saw some little private lakes I'd never seen before. But by then I was seriously focused on rivers. But I still had to cross the Pere Marquette again to get home. I did that on Walhalla Road (you are looking upstream). As you can see, by the time the river gets here, it's quite sizable, and the South Branch hasn't even joined it yet! 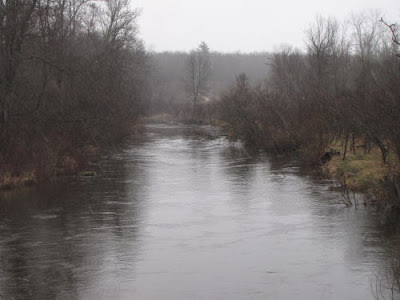 This is the river that's a mile south of my house and reaches Lake Michigan at Ludington. 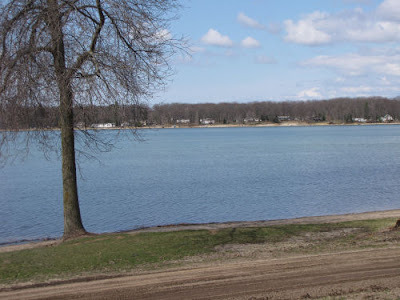 There it widens into Pere Marquette Lake, where the carferries are docked, and then out a channel into the big lake. Well, that's a lot of river pictures, I know it's probably overwhelming. There's a message in that. We DO have a lot of rivers here, and not every road has bridges. Getting around can be a challenge. Lots of roads keep the same name on both sides, but you have to know, or have a good map, which ones will actually take you across the water. More than once (not today) I've found myself at a dead end where a map showed a road going through, but... haha- joke was on me, and I got to backtrack. It's like a big puzzle! OK, I'll stop now. I had fun tracking rivers today. Hope you did just a little bit. I think perhaps I'm speechless. Oh, probably not... but really, how many more times do you want to hear about snow? 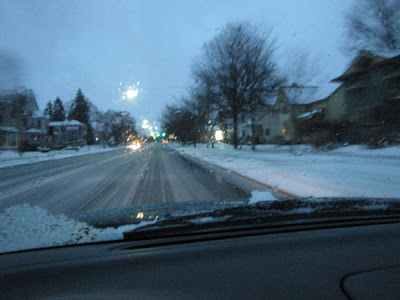 This is what it looked like as I drove home from the writer's group open mic night. The view was enhanced all too often by lightning. Yes, LIGHTNING. Well, I have a number of work assignments to do tomorrow, so at the worst you should see some little lakes with snowy edges tomorrow!